1. Richard Stallman doesn't use web browsers, he sends a link to a demon that uses wget to fetch the page and sends it back to him. 2. 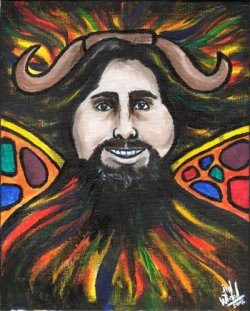 Richard Stallman is the only man alive who can pronounce GNU the way it is meant to be pronounced. 3. Richard Stallman doesn't read web pages. They write to him. 4. Some people check their computers for viruses. Viruses check their computers for Richard Stallman. 5. Richard Stallman's beard is made of parentheses. 6. Richard Stallman's nervous system is completely wireless. 7. Richard Stallman wrote the compiler God used. The Big Bang was the Universe's first segfault. 8. Some people wear Linus Torvalds pyjama's to bed, Linus Torvalds wears RMS pyjama's. 9. RMS once ate three 72 oz. steaks in one hour. He spent the first 45 minutes coding a new Emacs elisp extension. 10. Richard Stallman has no mother, he coded himself. 11. Richard Stallman has created the singularity, but since he usually works without an internet connection it won't be apparent for another two weeks. 12. Richard Stallman doesn't wget, Richard Stallman wdemands! 13. Richard Stallman has no problem using emacs. He wrote it with his 4 hands. 14. Richard Stallman never showers: he runs 'make clean'. 15. Richard Stallman released his own DNA under GNU FDL. RMS doesn't code, he just travel around the world. the first one is mostly true. I did hear something like that once. This first one is absolutely true. He briefly mentioned it in an email exchange between him and I.